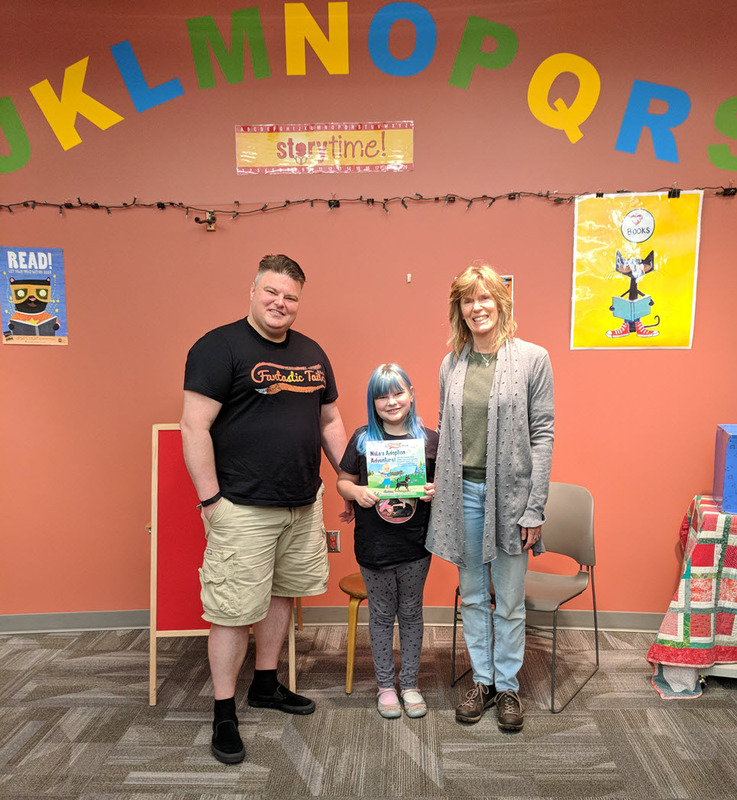 Emma Was Interviewed to Read Our Book at the Eugene Public Library in June! – Welcome to The Fantastic Tails Website! Welcome to The Fantastic Tails Website! Blog – Behind The Scenes at Fantastic Tails! Emma Was Interviewed to Read Our Book at the Eugene Public Library in June! Today was super special as Emma and I met with Cara Haakanson at the Eugene Public Library so that Emma could be interviewed to do a reading of “Nala’s Adoption Adventure” during a future “Pajama Storytime!” Emma did GREAT and Cara seemed excited to have her read and they were also brainstorming a fun craft to do during the event as well! Pajama Storytime is for children ages infant to 7 years old…and like the name says you CAN wear your pajamas! It happens every Tuesday at 6:30 pm and Emma is (currently) scheduled to read on Tuesday, June 12th at 6:30 pm! We’d love to see you there! Emma Doing A Practice Read While Cara Watches and Listens! Our Story Went LIVE In The Bethel School District B-Mail Newsletter! Emma Selling Signed Copies of Nala’s Adoption Adventure at Their Garage Sale! Free Pet Adoption Course & Email Updates! Sign Up to Receive a FREE Pet Adoption Mini-Course and also learn about our Book(s), Contests, and other cool stuff! Welcome to the Fantastic Tails Website! This is the place where you can find all of your Fantastic Tails Book, Contest, and FUN Info! Get A FREE Pet Adoption Mini-Course AND Email Updates From Fantastic Tails! Sign Up Below with your First Name and Email Address to get your FREE Pet Adoption Video Mini-Course! We will also keep you up to date on all of our behind the scenes info about our BOOKS, CONTEST'S, AND MORE!! !